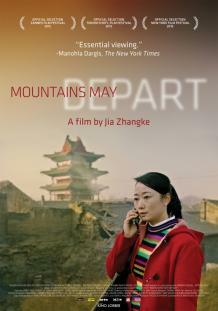 “Spanning the past, present, and future as experienced by a handful of characters, Mountains May Depart sees globalization and China’s boom years leading to a country reduced to a wasteland and a people that have irrevocably lost their culture. “Yet so confident is director Jia Zhangke’s touch that Mountains May Depart holds you with the humanity of its telling rather than the gloom of its conclusions. The film’s a triptych, with chapters unfolding in 1999, 2014, and 2025, the screen widening further with each era. In the early going, set in Shanxi province a naive local beauty, Shen Tao (Zhao Tao), is torn between two men, the poor but honest miner Liangzi (Liang Jing Dong) and Zhang Jinsheng (Zhang Yi), a swaggering up-and-comer who worships America, drives a hot red car, and is putting all his money in coal. It’s not much of a contest.